Thousands of Greeks took to the streets again Tuesday to protest a set of austerity measures many in the country say are controversial and will further disenfranchise the already hard-hit public sector. On Monday, Greek legislators approved a redeployment regimen as required by its International Monetary Fund (IMF) creditors bailing out the cash-starved government facing its sixth recession year. Under the bailout requirements, the government must “redeploy” 12.500 public sector and civil servant employees by the end of September in order to qualify for loans from the IMF and EU. Another 12,500 will be redeployed by the end of 2013, and at least 4,000 civil servants will be sacked in a bid to restructure the public sector. The redeployment regimen is risky as it offers no assurances that everyone will be placed in different jobs. Most of the 12,5000 are likely to end up at home receiving reduced pay or eventually laid of altogether. 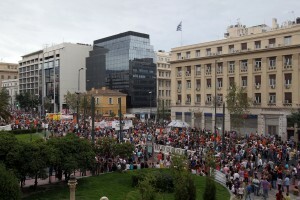 Doctors on Tuesday joined in the week-long strike when school teachers and university professors walked off their jobs and marched in several Greek cities and towns. Social security staff, lawyers, nurses and wardens have also joined in the protests. Many expect that state ministries will also be affected by the redeployment.